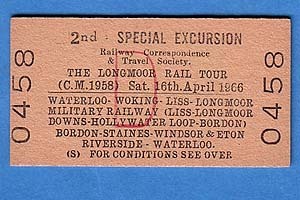 (1) The first of two tours run in April by the RCTS to the LMR. (2) On the LMR there were two trains run from Longmoor Downs round the Hollywater Loop (12.10-13.40 & 14.00-1530). Did both use the same traction as indicated above?
? via Holywater Loop ? ?